Disappointingly, this game is called Cone Zone, not Coney Island. 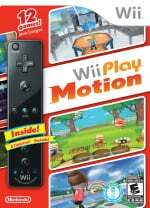 The MotionPlus-enhanced Wii Remote Plus has plenty of potential uses: as a sword in Red Steel 2 or Legend of Zelda: Skyward Sword, or any number of sporting implements in Wii Sports Resort, but it's about to get a real workout in Wii Play Motion. 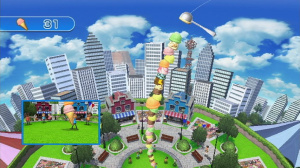 Nintendo has published the first screenshots, available below, that reveal a little more about how the controller will be used: stacking a giant ice cream cone, whacking Miis with hammers, reeling in treasure, fanning balloons and more, but potentially one of the more addictive games sees the controller become a stone to skim across a calm lake. If the control scheme works, this could be the next Frisbee Golf. Check out the Wii Play Motion screenshots and in preparation for the game's release next month. Any word on what it will cost? If this is a 50 dollar pack-in with a Wii Remote I will certainly track it down somewhere for 10-20 dollars. The screenshots for the most part actually look very good. If however it is a 50 dollar stand-alone game, it will simply have to wait. Some of the games look fun, I need a new remote anyway. Most people will buy it for the wii remote, i think. I'm getting it for the game and the remote. Certainly sounds more fun than the first Wii Play! I hope that's the case! Then again, I'll probably end up buying 3DS games instead (in two months...). If it's sold seperately for 10 Euro or something. I will buy it. Would be interested if it were sold separately or if I knew someone who needed the remote. I'm cautiously excited for this . they should make a new mario party game for wii motion plus. i think the only reason they dont is because not everyone has the attachment or controller+. I was just thinking the same thing as soon as I read Coney Island on the picture tag. I just got Mario Party 5 and that's one of the first minigames I unlocked. Anyway I'm getting it for, you guessed it, the remote. The game is just a bonus. Especially since it's a red remote over here! "The MotionPlus-enhanced Wii Remote Plus has plenty of potential uses: as a sword in Red Steel 2 or Legend of Zelda: Skyward Sword, or any number of sporting events in Wii Sports Resort...."
If this is a 50 dollar pack-in with a Wii Remote I will certainly track it down somewhere for 10-20 dollars. I mainly want it for the Red Remote plus, but it's surprising how much fun you can get out of these little pack-ins. This game I'll buy for the included wiimotionplus wiimote controller. The included mini games could be worthwhile. Wii Play did not cut it as a game. Even with my 2 boys who play alot of Wii games they just never went back to this. This looks a bit more like the minigames in WiiFit Plus, which while mainly single player, were still way better than Wii Play. I can't imagine this will sell anywhere near as well as Wii Play though, a lot of people needed the extra remote back then, how many people need 1 now? May pick this up used at GS for next to nothing (got Link's Crossbow Training game for $2.50 soon after it's release, money very well spent).